The Art Center can not wait to get this art exhibition to YOUR school! If you're interested in the Art Expedition, fill out this form and we will contact you with the dates that we can accommodate. 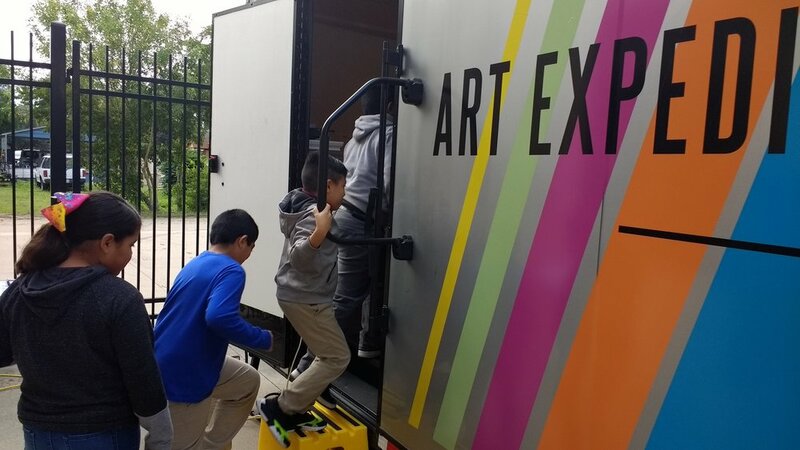 Art Expedition brings an art exhibit directly to schools and the community in the Waco area as a trailer re-designed as an art gallery. The Art Expedition program provides a low cost, unique, educational art experience to students who might not have the opportunity to go to an art gallery. 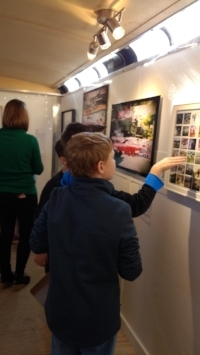 Throughout the 2017-2018 school year The Art Expedition visited ten schools and six public events with over 2,200 people touring the exhibit. We are excited to announce that this year's art exhibit has come from undergraduate and graduate art students, and the artwork has the theme: Transition. -The Art Expedition is a traveling art exhibit that comes to you! -We have converted a large cargo trailer into a climate controlled, lit gallery space. -The Art Expedition is an opportunity for students to have an informal educational experience that will help build connections between visual arts and language arts. -Chosen art work does not live in the Art Expedition trailer. Instead, it is carefully transported and handled the day of each visit to ensure its safety and condition. -Currently our offerings are geared for either 3rd, 4th, or 5th grade classes. -Priority is given to Waco ISD, but we are open to visiting other districts. -First, fill out our online form. You will be asked to select a grade level (either 3rd or 4th grade) and to provide your first, second, and third choice of dates for us to visit. Art Center staff will then contact you to work out details and schedule our visit. -The trailer will arrive a day in advance so that we can park, set up, and install the art inside the gallery. -After the large group presentation (mini-lesson), students may return to their classrooms and will be escorted to the gallery in small groups (approx. 8-10 students at a time.) Everything goes faster and smoother if your school has at least one staff member or a volunteer that can shepherd the students to and from the unit for us! -Typically small groups need about 15 minutes to do the activity in the Art Expedition mobile gallery. Students are paired up and are given the opportunity to apply skills taught during the large group mini lesson while looking at art in a gallery setting. 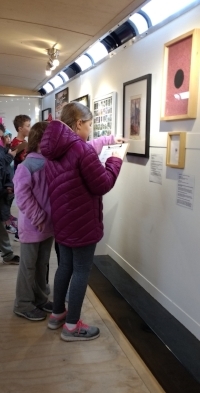 Students are taught basic gallery etiquette, ways to look at art, and tools that can be used to explore art works deeper such as the art elements, design principles, and sensory or figurative language. Before 11:30 a.m., we can get 5 classes of students through the Art Expedition. If your school has more classes, we can work out a multi-day visit if needed. -Depending on the day of the week, our driver’s schedule, and your needs, we may remove the trailer the afternoon of our presentation or may be back the next day (Monday if it’s a weekend) to remove the trailer from your site. -Our goal is to provide an art experience that will kick-start enthusiasm and conversation for students and teachers to see the connection between visual art and language arts. We have prepared a post-visit extension lesson specific to Visual Art and one specific to Language Arts for your teachers to use if they so desire. -We can provide pre-visit lesson advice should your teachers wish to prepare students for our visit, but no preparation is really needed! -Our post-visit lessons are TEKS focused. -If your school has an art teacher, we strongly encourage them to work alongside the core-language arts teachers to help make connections. For example, both the language arts and visual arts post-visit lessons have finished products that could be displayed together! -We bring an art gallery experience TO your school. -The Art Expedition saves cost and time that a typical field trip would require your school. -The Art Expedition provides an informal learning environment for students to engage with high quality art in an approachable way. -The Art Expedition, makes connections between Language Arts TEKS and Visual Arts TEKS. -The Art Expedition jump starts conversation and units of study for students and teachers to continue exploring even after we leave. $250 for a half-day visit (up to 5 classes, 125 students). $50 of this is a non-refundable deposit to reserve your date. $175 for each additional half-day if you have more than 5 classes of the grade level you select. -Think about where a good location would be to park the Art Expedition mobile gallery. -Secure at least 1 and up to 3 available adults (staff members or parental volunteers) to help shepherd students to and from the building to the gallery. -If your school has an art teacher, consider finding them a substitute for the morning and allow them to participate too! -Let your art and chosen grade level teachers know that we’re coming! We’ll provide lessons that they can use to extend learning, and they may also want to be thinking about this ahead of time! -Let your custodians know that we are coming. How do I sign my school up for an Art Expedition Visit?